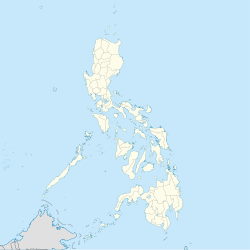 Hindang, officially the Municipality of Hindang, is a 5th class municipality in the province of Leyte, Philippines. According to the 2015 census, it has a population of 20,924 people. In the north, it borders with the town of Inopacan while it borders with the town of Hilongos in the south. Himokilan is part of the Cuatro Islas, are within the administrative jurisdiction of the municipality of Hindang. Hindang is politically subdivided into 20 barangays. In 1957, the sitios of Kanhaayon, Kapudlosan, Himokilan, Anolon, Mahilom, Baldoza, and Tagbibi were converted into barrios. In the 2015 census, the population of Hindang, Leyte, was 20,924 people, with a density of 420 inhabitants per square kilometre or 1,100 inhabitants per square mile. ^ "An Act Converting the Sitios of Kanhaayon, Kapudlosan, Himokilan, Anolon, Mahilom, Baldoza and Tagbibi, Municipality of Hindang, Province of Leyte, into Barrios of Said Municipality". LawPH.com. Retrieved 2011-04-12. Wikivoyage has a travel guide for Hindang. This page was last edited on 24 February 2019, at 09:25 (UTC).